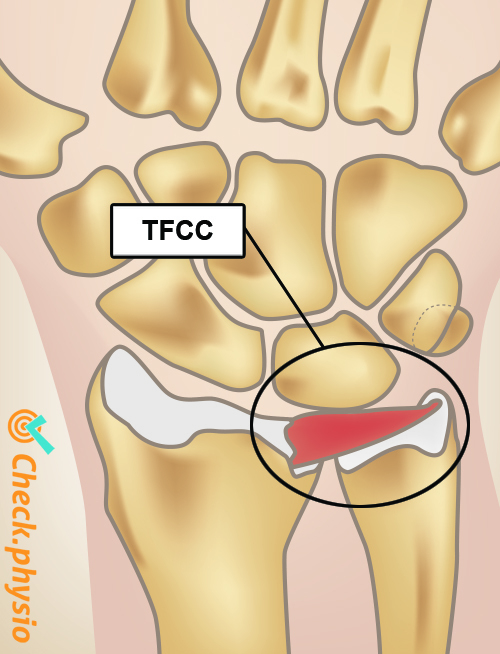 The TFCC (triangular fibrocartilaginous complex) is a set of structures located on the little finger-side of the wrist. 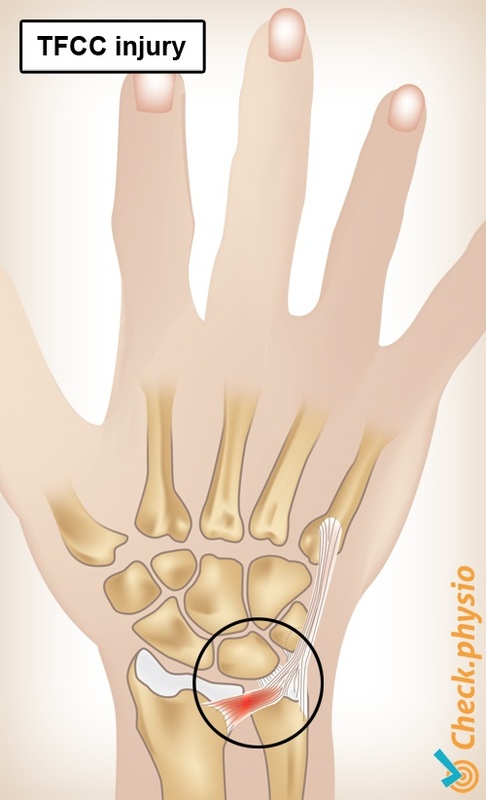 Injury of the TFCC can cause symptoms on the little finger-side of the forearm and wrist. The symptoms can develop acutely or gradually. Everyone over the age of 50 years will have some degree of TFCC degeneration or wear-and-tear. However, many people do not experience any symptoms. The TFCC connects the elbow bone (ulna) to the radial bone (radius) and a carpal bone called the "triquetral bone". The whole structure consists of a cartilage disc that - together with the various ligaments - fills the open space on the little finger-side of the wrist. The disc is also referred to as the "meniscus of the wrist", because it functions in a similar way to the meniscus in de knee. The role of the TFCC is to stabilise the radio-ulnar joint and to absorb forces acting on the wrist. It serves like a bumper cushion that absorbs most of the forces acting on the wrist joint. Injury to the TFCC can occur in various forms. The disc, the ligaments and the cartilage on the joint surfaces can become damaged, making movements and loading of the wrist joint painful. Most TFCC injuries occur as a result of a fall on an outstretched hand, which exerts a significant force on the (over)extended and rotated wrist. The over-extended and rotated position of the wrist joint appears to be an important factor in the development of the symptoms. TFCC injury is therefore more common in sports such as gymnastics, hockey, tennis, boxing and pole vaulting. Degeneration of the TFCC can occur from the age of 20 years. This means that the structure deteriorates in quality. High pressure on the TFCC or repetitive use can cause damage to the disc and the cartilage. In some cases a relatively long ulna in comparison to the radius causes the space between the ulna and the wrist to be smaller than normal. The TFCC is thinner in this case. This also causes additional forces on the ulna and the TFCC, because the ulna is more prominent in the joint. Pain on the little finger-side of the wrist. The pain becomes worse when the hand is bent at the wrist joint towards the little finger-side. Movements with a heavy burden are painful. 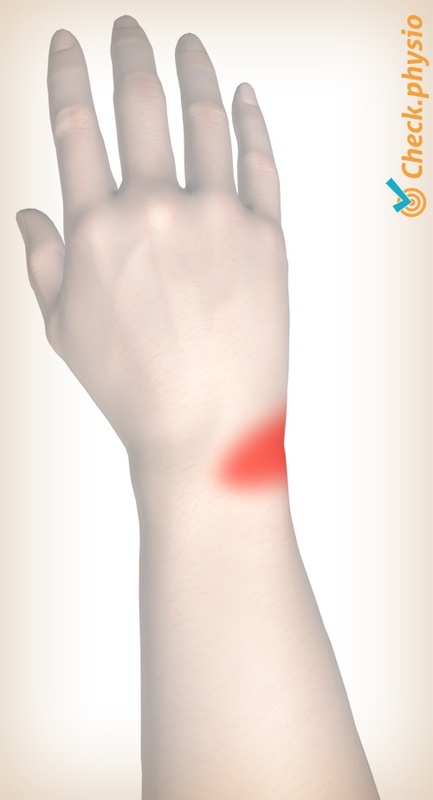 A cracking or clicking sensation can be present in the wrist during movements. Pain with forceful squeezing or making a fist. Direct pressure on the TFCC is painful. Loss of strength can occur in the hand. It is important to determine the cause of the injury. If this is not immediately clear, the patient's daily activities should be discussed in order to determine the causative factor. Small tears in the TFCC can heal without intervention. A larger tear caused by a trauma (accident or fall), can take a long time to heal. Recovery can take several months or even years. If conservative treatment in the form of (relative) rest and physiotherapy does not yield results, a surgical intervention can be considered.